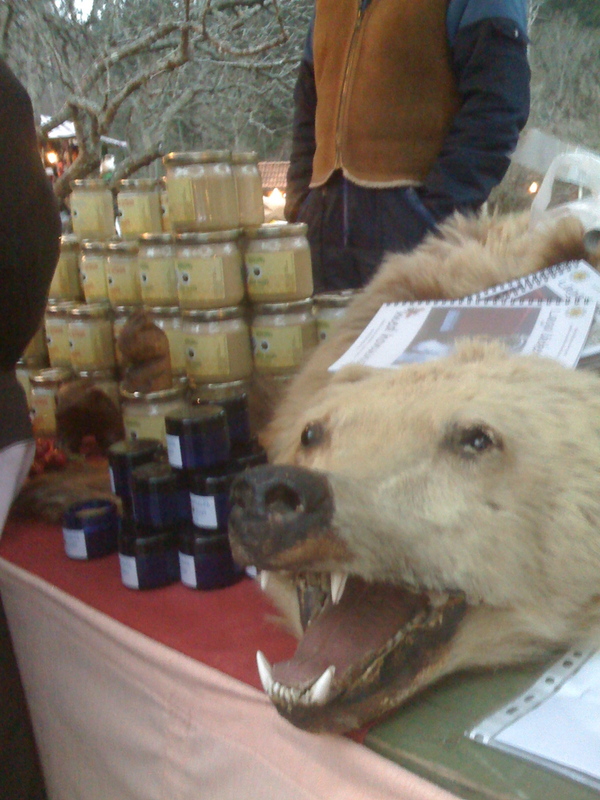 This afternoon we went to the Christmas market at Tyreso Castle. 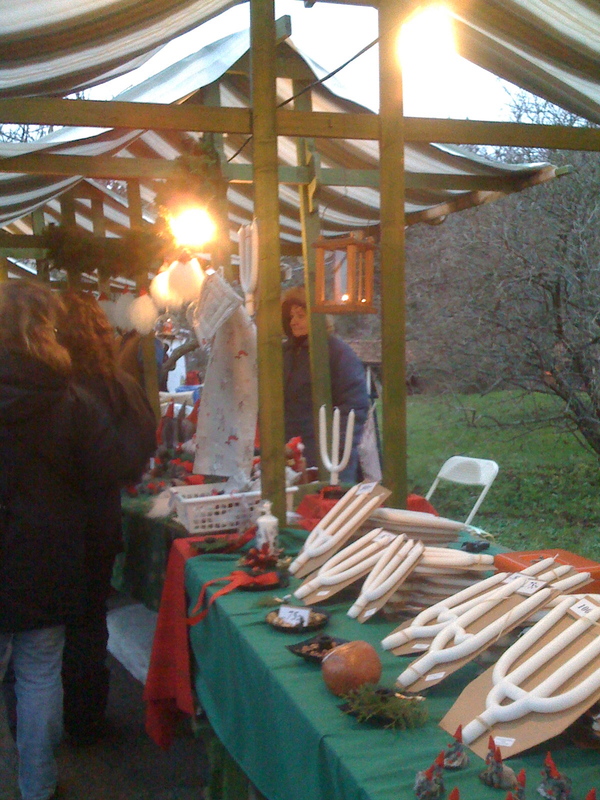 It was very nice – lots of artisans at stalls selling their homemade handicrafts. Leon found some strips of material that he bought with his pocket money, and Maya found a ceramic heart shape that she spent her money on. 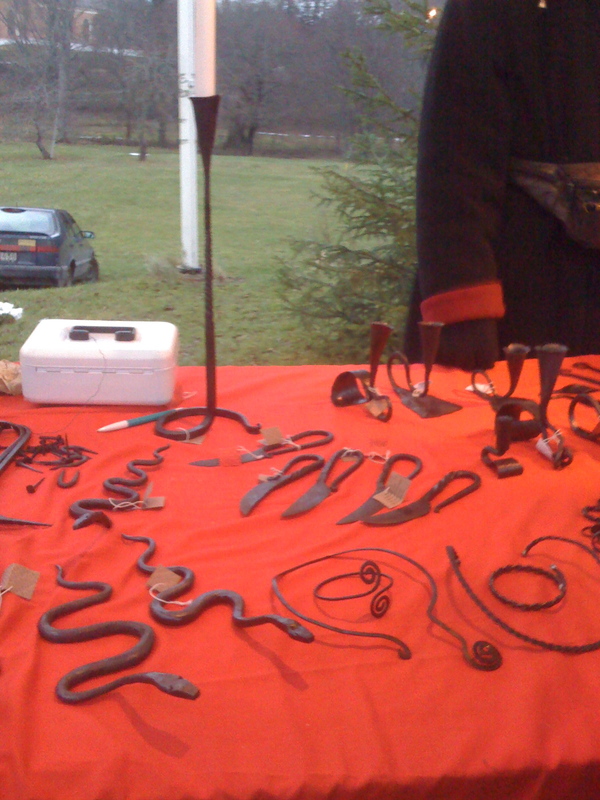 ....and some of his wares. 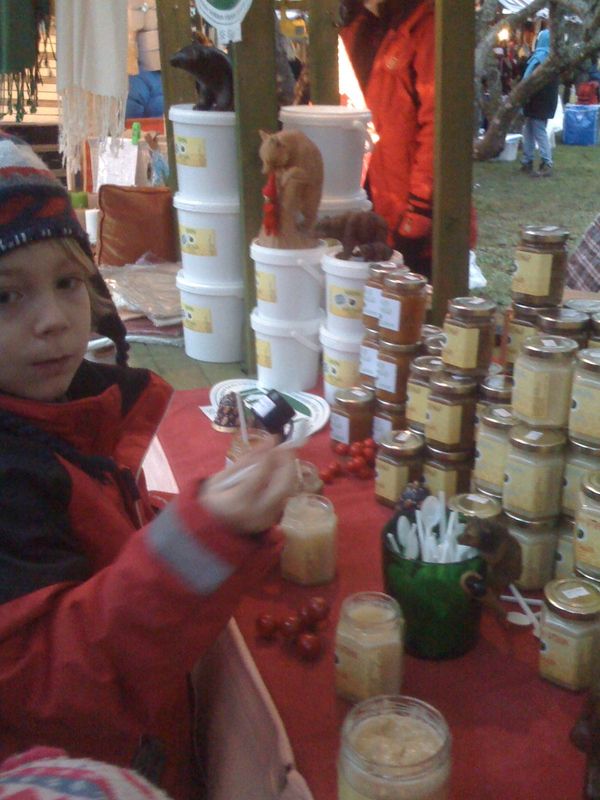 ...and Leon tasting the various kinds. Feeling the sheep's wool rug. Afterwards we went for a walk through the grounds by the lake, and back through the castle – it was very atmospheric all lit up by candles in the dark. 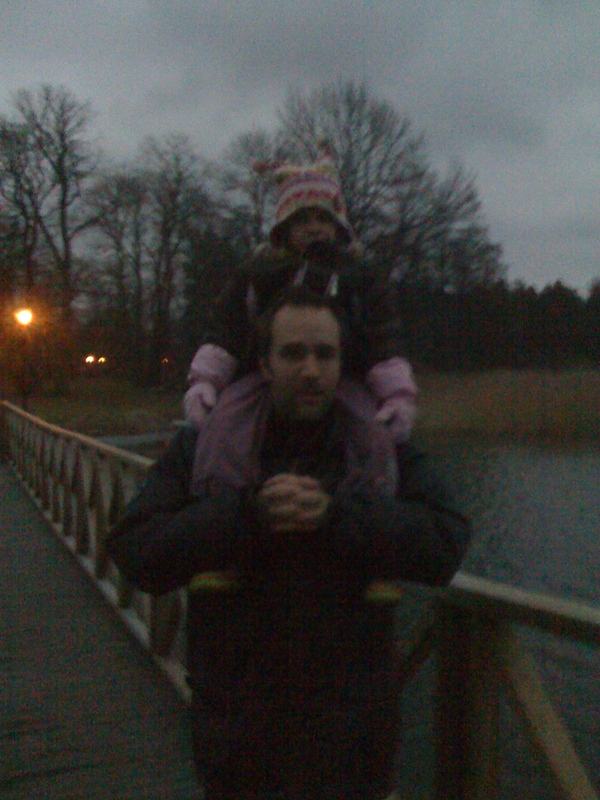 Richard and Maya by the lake. I just took a quick look back at my posts. Have we been making any progress? Are we really doing anything? And am I still able to “home school” when my kids attend school???!!! I think so…. 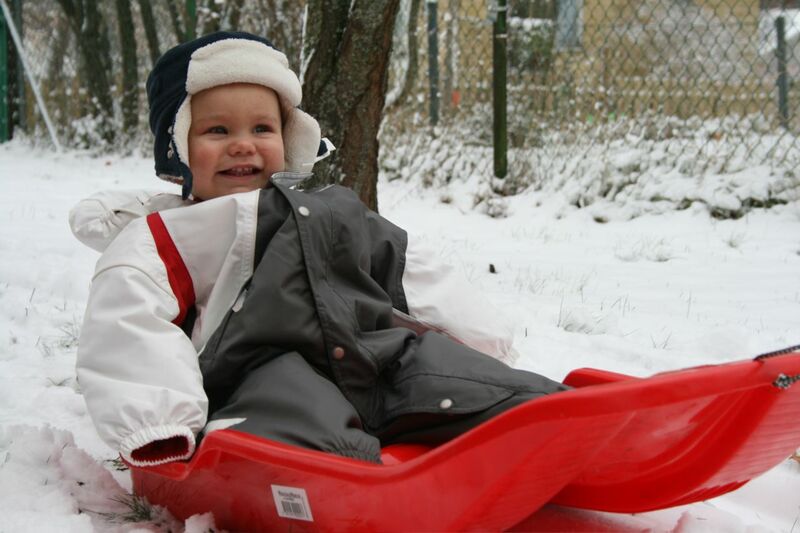 When I look back, I see that much of our time in the last two weeks has been taken over by sickness (and often tiredness for myself because of little Alfie), and some days by visiting grandparents, and more recently, the snow!!!! What have we done? 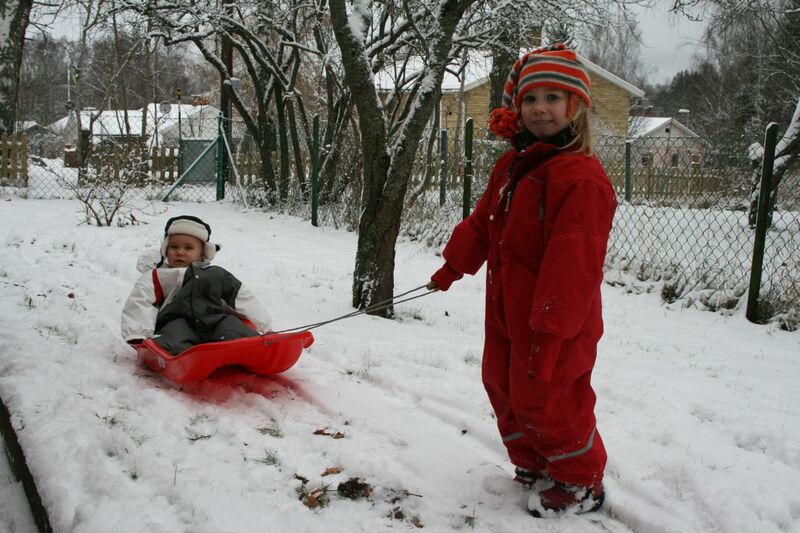 The first week we continued our topic of fairy tales, and the second week we should say that our topic was snow!!! After all, as I mentioned previously, seasonal changes are the greatest educational experience, and being “in” them and exploring the senses through them, is way more beneficial than noting the changes on paper. Also, with seasonal learning, one must grab the experience when we can – there’s no point learning about rain if it’s sunny outside…. As for grandparents, well that’s another learning experience. The importance of family, and learning how to socialize with people of different ages and backgrounds will help us to grow in many ways. Our grandparents have lots to teach us about, and lots of stories to tell, for they have lived longer and experienced more – just as kids can learn from babies and younger children by learning how to take care of them, take responsibility and share with them. We would become very closed people if we were to always socialize with people born in the same year – how much would we really learn then? Sometimes I look at the activities and I think perhaps they are too easy, perhaps not challenging enough (particularly for Leon), and many of the activities have been initiated by the children themselves, and not organized by myself at all! Is that okay? Well, I think so. I am learning with my children too. Perhaps Maya will enjoy an activity more, or perhaps she will simply show this more, and Leon will go away and think about the experience, and then come up with an idea a few days later? 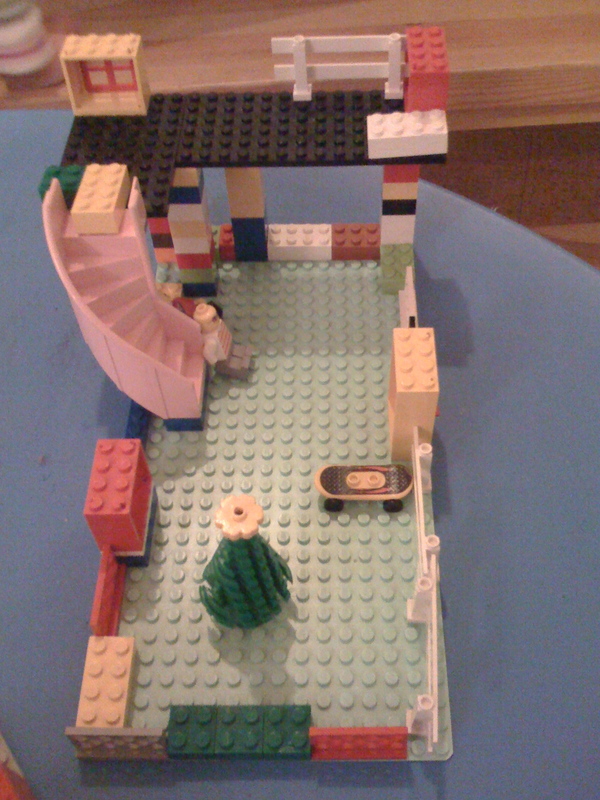 Would he have made a labyrinth from lego if we hadn’t read “The Minotaur”? 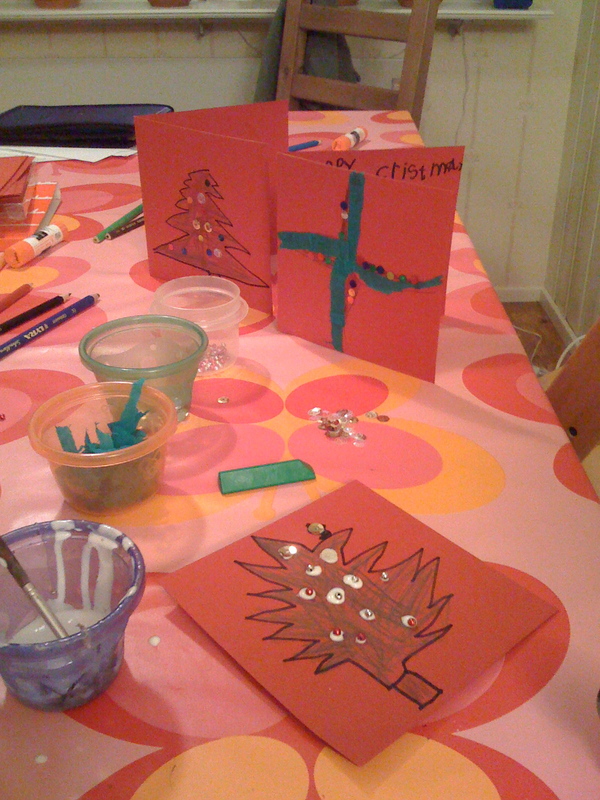 Would he have made a forest inspired “looking -box” if we hadn’t made a forest scene inspired by the Elsa Beskov books? Would we have drawn and discussed snowflakes if we hadn’t read the picture books? 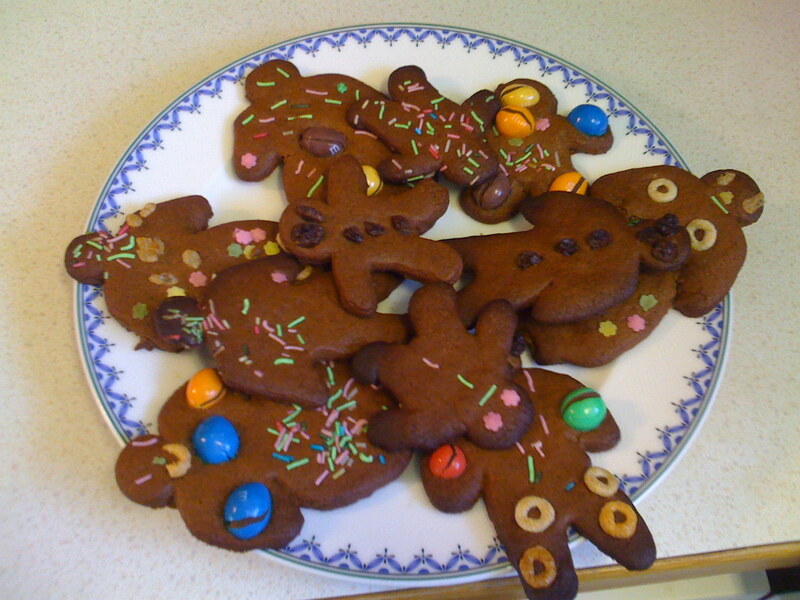 And yes, perhaps “The Gingerbread Man” is too easy for Leon, and perhaps he has made gingerbread men many times in his life – but does this matter? Is it not good to have fun, and re-read books, and re-do activities with people who are close to you? 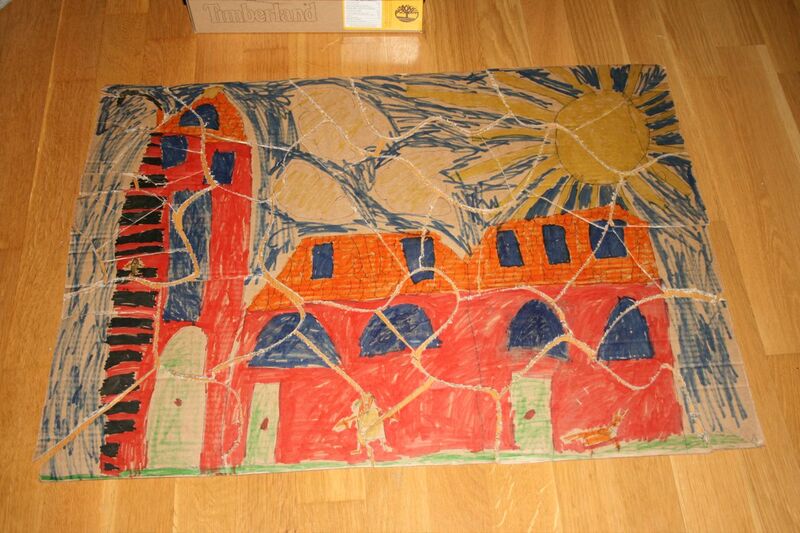 And as for child initiated activities, would many of those creations above have been made if it wasn’t for this? In my opinion, this is another of life’s great learning experiences, not just for children but for adults too! What do we learn? Everything! 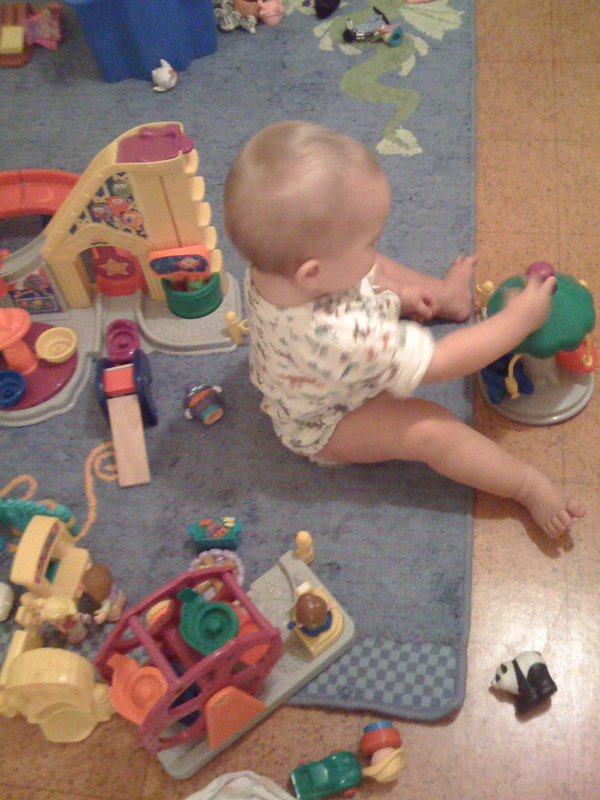 Problem solving, social skills, creativity, language, motor skills… the list is endless depending on the activity. And many people teach themselves more than others can teach them, and Leon is a prime example of this type of learning. What to do this week? 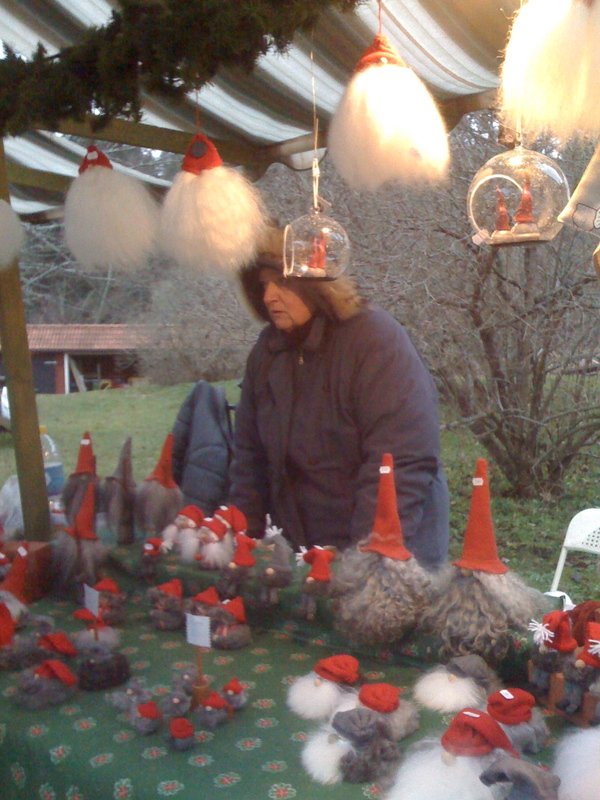 Possibly wild animals of sweden as a continuation to what Leon’s class are learning, and possibly a few Christmas activities, as of course, it’s that time of year…. I havn’t written for a couple of days – Mormor & Patu arrived on Thursday evening, and it’s just been chat chat chat since then!!! 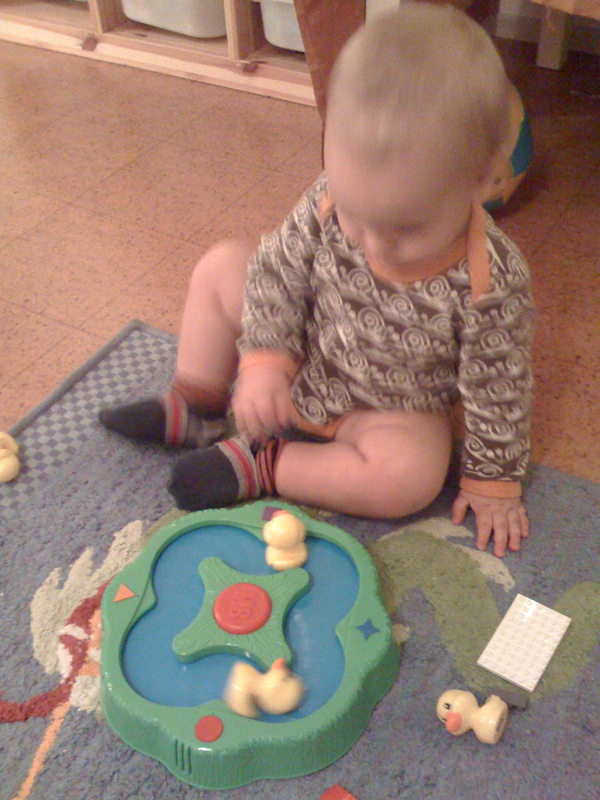 And Alfie played with the ducks…! Yesterday, Friday, Maya had gymnastics in the morning. 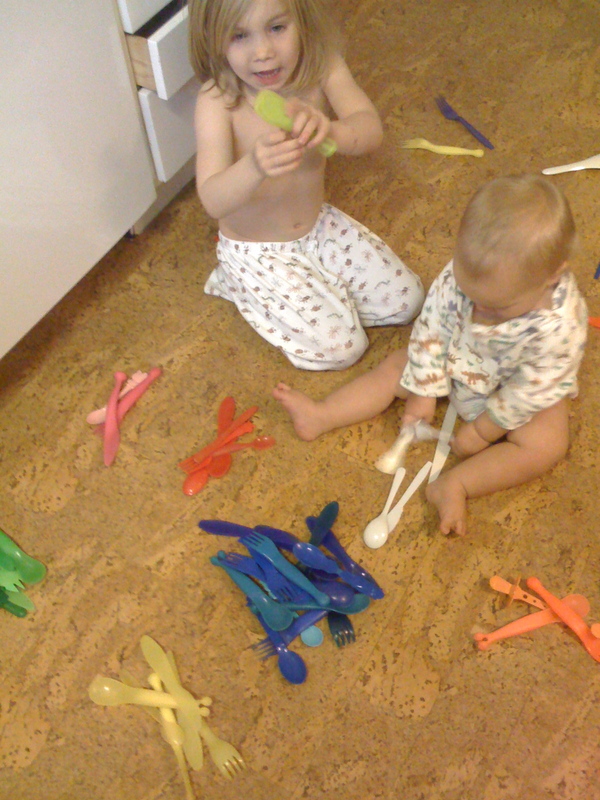 We had a pretty restful afternoon just playing and drawing and enjoying seeing Mormor & Patu again! This morning Leon has gone to Alexander’s birthday party, and Maya has gone to choose her costume for the preschool Lucia “train” (will she be a Lucia girl, a gingerbread man, or a father christmas..???). The sun is shining and the snow is finally melting away. Leon and Maya spent some time making giant snowmen and giant snowballs in the last of the snow with their friends Daniel, Sebastian and Adam, who came to play yesterday afternoon. They are three brothers, and the most lovely boys you’ll ever meet – Daniel is 10 years old, and Leon’s “fadder” which literally means he’s like a surrogate older brother in the school, and his job is to see that Leon is okay (the school wins points from me there!) . Sebastian is in the year above Leon and they often play together at school – the english language helps (their dad is Welsh). 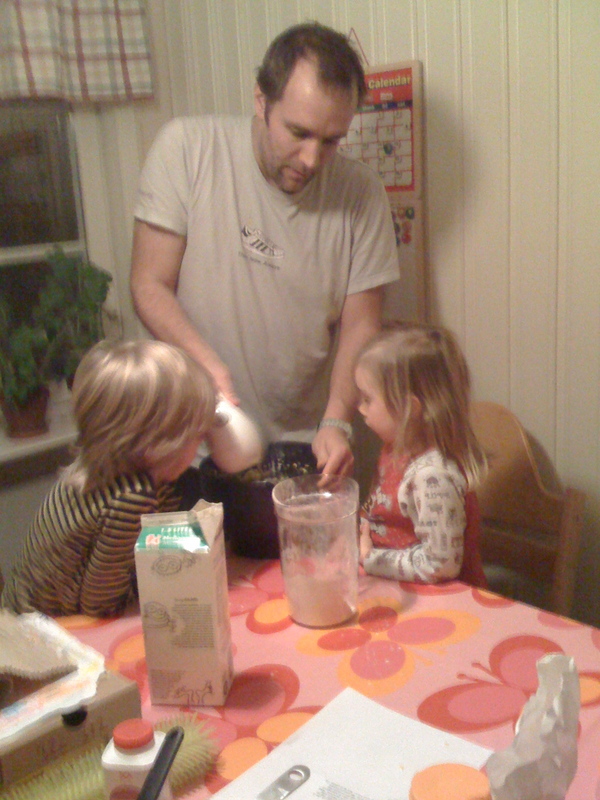 Adam is the youngest and around Maya’s age. 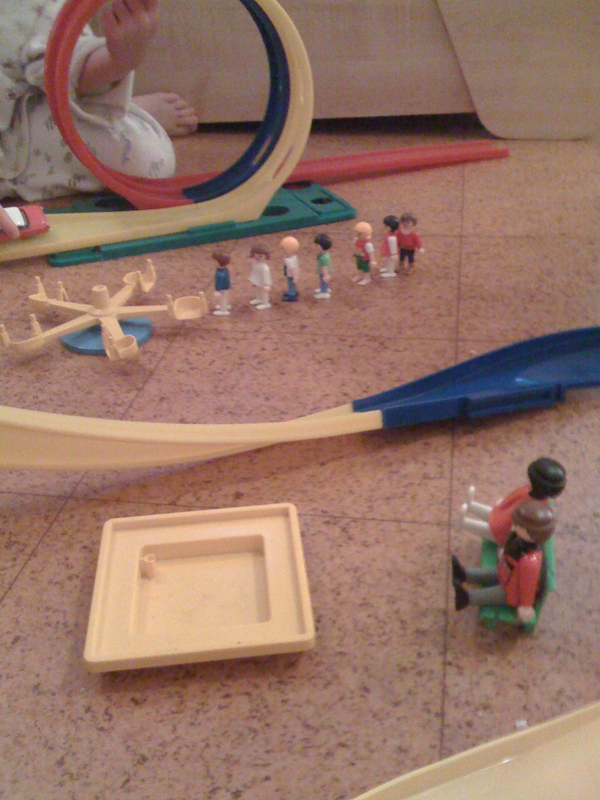 Later on Leon and Maya spent the evening in the playroom combining the car track with the playmobil people to make a fairground! 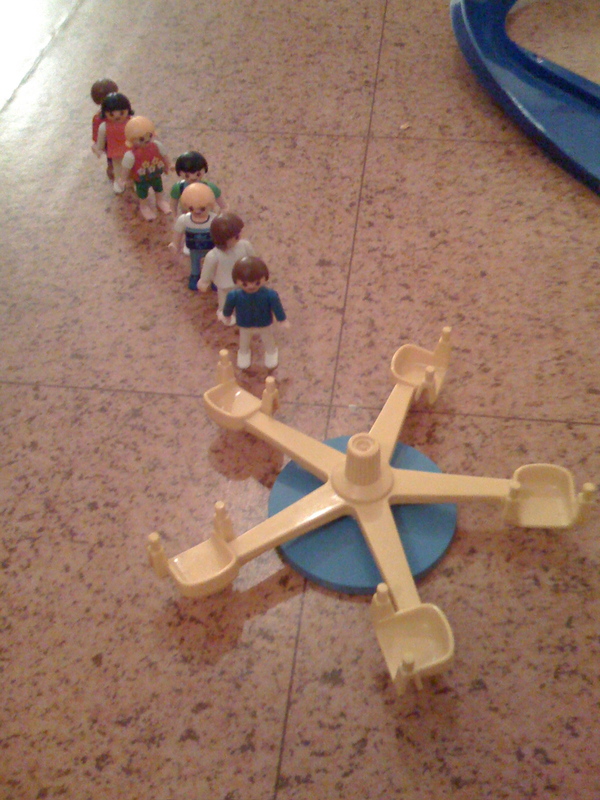 Lining up for a ride.. 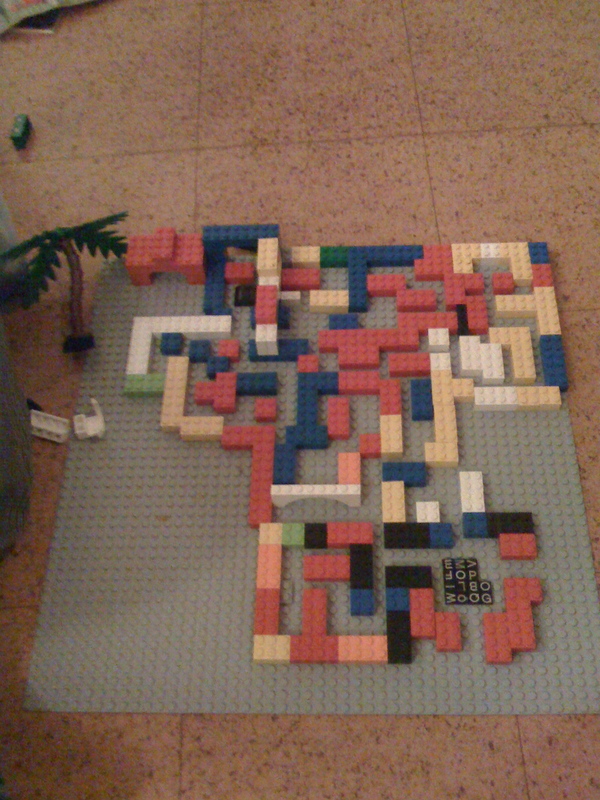 Earlier on, Leon also made a “labyrinth” from lego, possibly inspired by the greek myth “The Minotaur” in which the minotaur is trapped in the labyrinth, and people are led into it for the creature to eat. Leon is thoroughly enjoying the greek myths, and we read more last night. Tonight “Mormor” (grandma – my mother this time! ), and Patu (the kids “step” grandad), are arriving from England . The kids are very excited as they love them very much! Last night Alfie had a fever pretty much all through the night, and he threw up a few times today, and his fever continued. Richard took the day off work, and both Leon and Maya went to school / preschool – I had really wanted Maya to go as I felt it would be more fun than staying at home with a sick baby, plus I’m keen for her to meet a couple of girls to play with. Lately we seem just to have met boys to play with! There is nothing wrong in this, but I do feel that they play very differently at this young age… Maya still hugely enjoys role play with dolls, small characters, soft toys, etc. 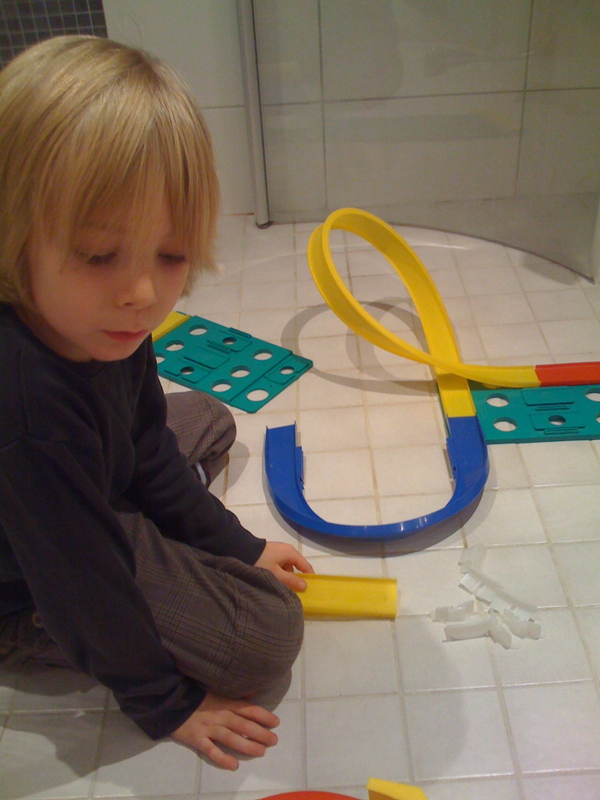 Leon still enjoys this to an extent, but mostly he’s now into either more serious activities (painting, drawing, creating, calculations..), or is into physical games with rules such as tag, colour tag, stuck-in-the-mud, etc. Very few boys we have met (bar one) seem to have the ability to concentrate and focus on real role play in the way that Maya does, or Leon occasionally will, and has done, without it becoming an aggressive monster v monster type game…! ANYWAY! Predictably Alfie was pretty unwell all day, and I got very little done. When the kids came home we did, however, check the ice sculptures, but unfortunately only the tops of them had frozen due to the weather “warming” (!) and going up to 0 degrees celcius. I tried to explain this to the kids and we have left them out for another night to see if they will freeze totally. I must try to show them an outside temperature gauge tomorrow! 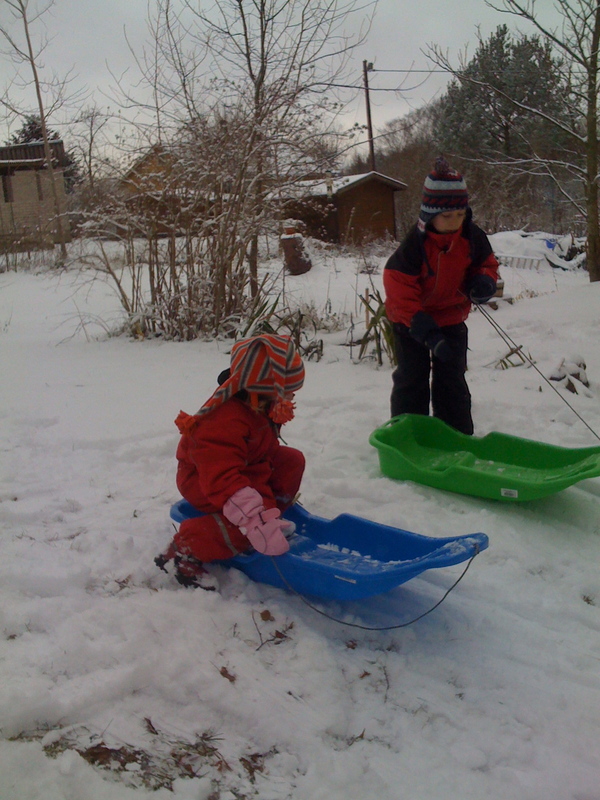 The kids spent most of the afternoon outside playing in the snow. 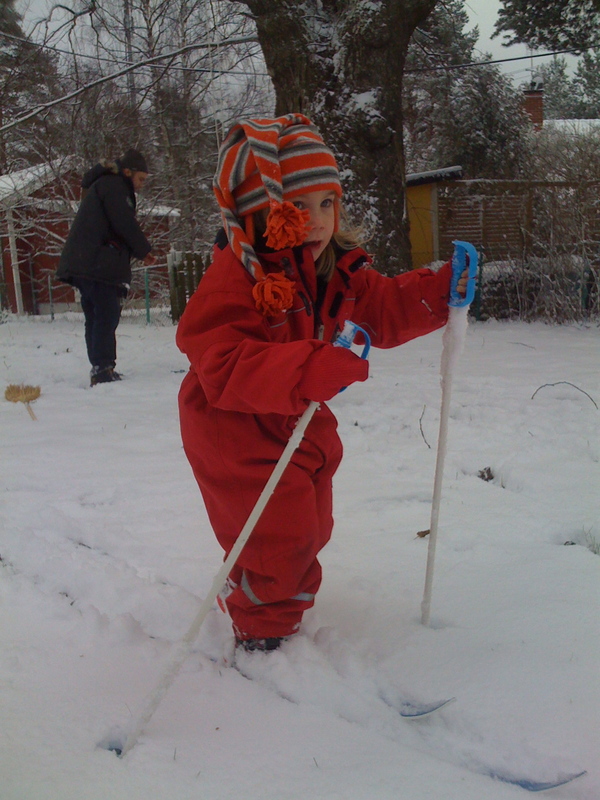 This is a very positive thing – the weather and seasonal changes are, in my view, one of the most important learning experiences in childhood, and exploring it first hand is the best thing possible! And after all, in a few days the snow might be gone! Later I read some more greek myths to Leon, which he really seems to enjoy! Maya went down into the workshop to make a creation from wood – it’s wonderful to see her using a wrench and a file in the appropriate way all on her own, and knowing that we taught her this. 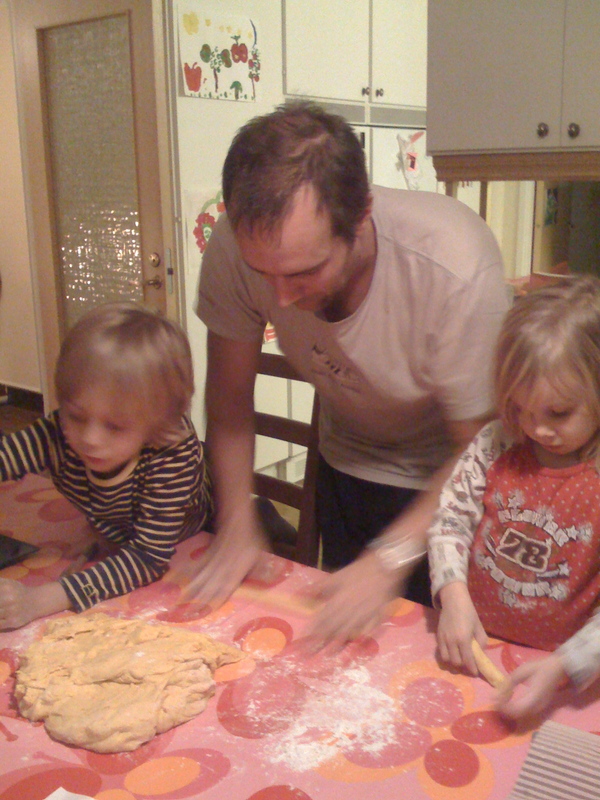 Richard has begun reading a chapter book to them both – “Mio min Mio” by Astrid Lindgren, and this is how the day ended! 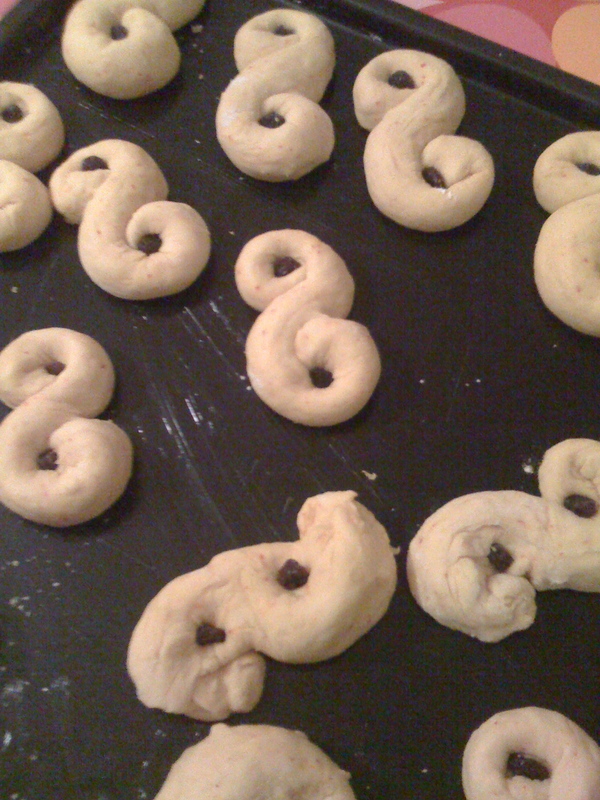 Saffrons bullar (saffron buns) for breakfast, before Leon went off to school in the snow. The snow was truly mad today. It snowed and snowed all day, and the wind blew and blew. Our snowman had a huge pile of windswept snow right beside him. 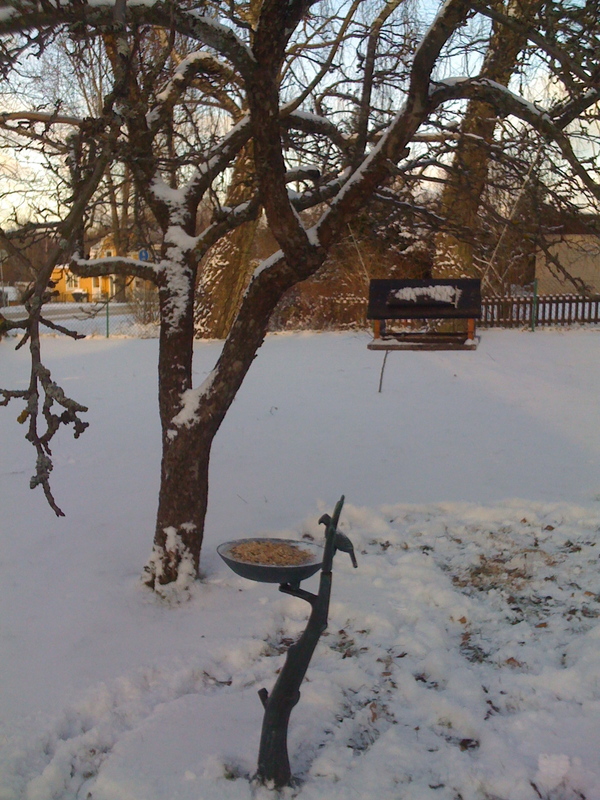 The garden and roads were deep in snow – there were no edges – just snow! Maya decided she didn’t fancy dagis (preschool) today, and I’m not one to complain, so she stayed at home with Alfie and I. Unfortunately Alfie wasn’t in the best of moods, and I could barely put him down – teething perhaps? We did a bit of roleplay with the Noddy character toys and our homemade forest, and she did some dancing, and then I finally got to read some books to her while he slept – and we read lots of fictional books about snow!!! Somehow today seemed tough. The kids seemed to argue a lot, Alfie didn’t stop grumbling, and I felt very unfocused… perhaps knowing Leon was back to school after a week at home? 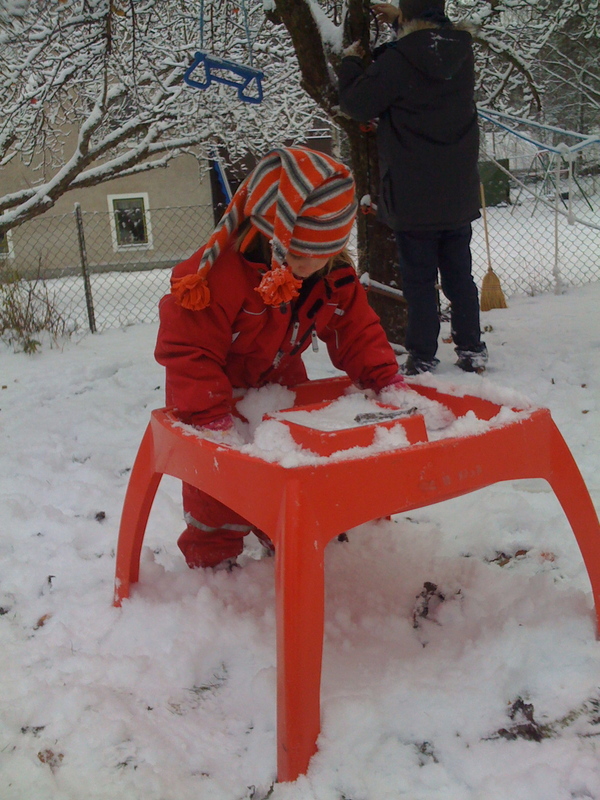 In one of the snow books, “The snowy day” Leon noticed the beautiful prints of snowflakes on the pages. We tried to draw our own snowflakes, and talked about how each and every snowflake was different, and that they were made up of crystals. We had some juice and biscuits, and briefly watched some of the old “Mr Men” series – including Mr Snow – as we were all tired, and I wanted to settle Alfie. I set up an activity – we filled up shaped rubber ice cube moulds, plastic containers and some plaster moulds with different coloured water, and put them outside to freeze. The kids were fascinated by the way the colouring moved as it was dropped into the water, and the colours looked fantastic against the light. We talked about making ice sculptures tomorrow, and I told them about how ice sculptures are sometimes used to keep food cool. 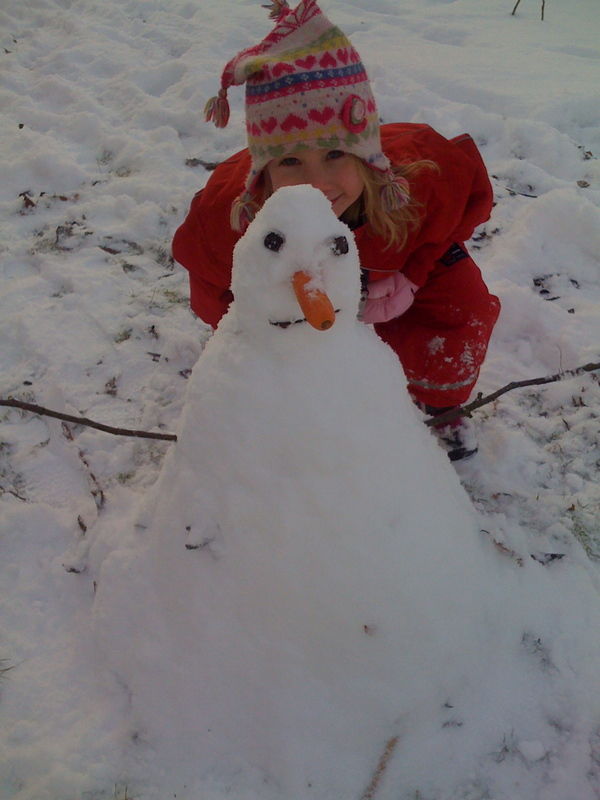 Later Maya made her own snowman from cardboard, glue and cotton wool, the kids went mayhem with the balls I’d set out for Alfie, and then after dinner they went outside to clear the driveway from snow with the boys from next door…. Tonight I started to read to Leon from a book of myths and fables. I’m starting to read to him some of the ancient greek myths – tonight it was “Odysseus and the cyclops” and “The Chimaera”, among others. I think he might find these stories fascinating. 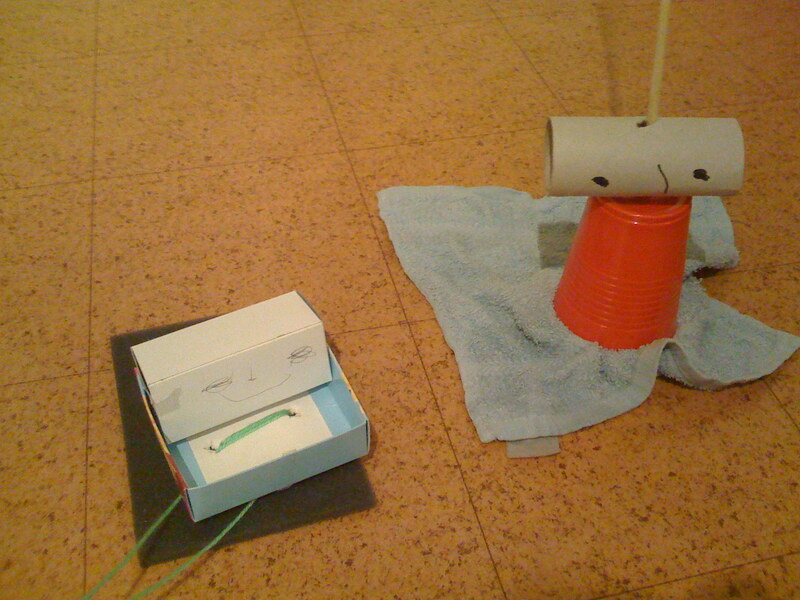 As Maya and I created an egg-box caterpillar at 6.30am this morning, we looked out onto a white and windy garden. A definate blizzard! It is quite amazing to watch your own garden turned into a tornado of white, and watch the snowflakes darting this way and that in complete chaos! Later in the morning, when the wind had died down we went out in the snow. Having talked to the kids about looking after the birds in the winter, Maya noted it was time to hang up the bird house, and put out some seed. Leon and I then spent some time sledging together over on the hill at little Leon’s (Maya’s cold threshold is minimal!!!). 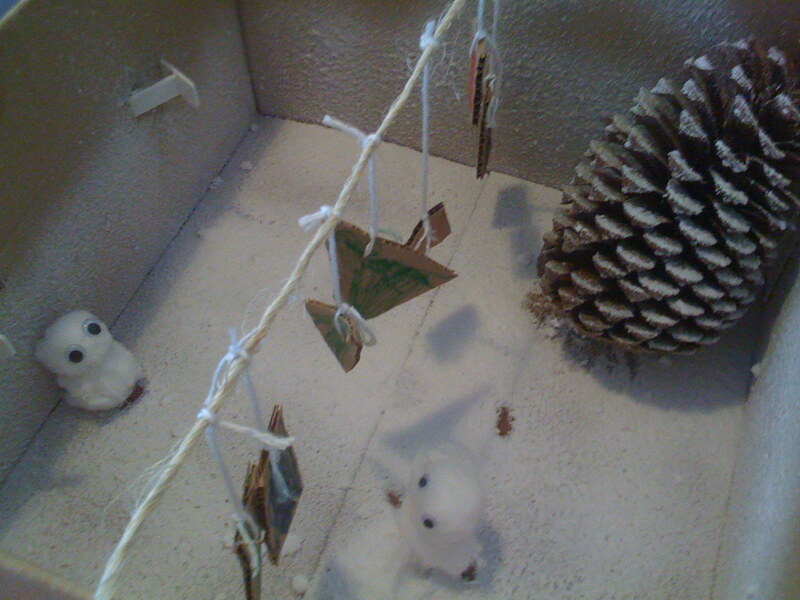 Meanwhile, inside, Maya was inspired to make a snow scene in a box! We had friends (Lotta & Per) for lunch, and then went with them, and little Leon’s family, to a nearby “pulk-backa” (sledge-hill). 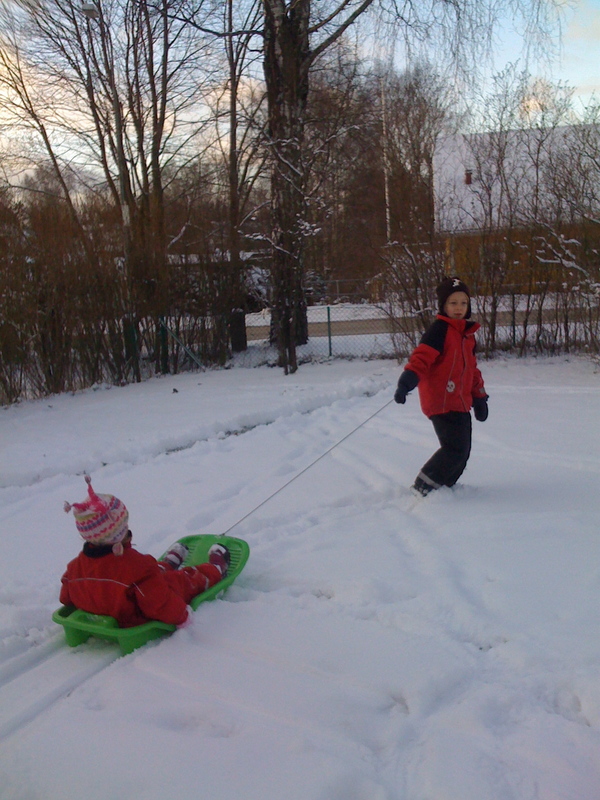 Lotta and Per had brought along a snow-racer which was fantastic fun! We all had a great time going up and down (and Leon became really brave! 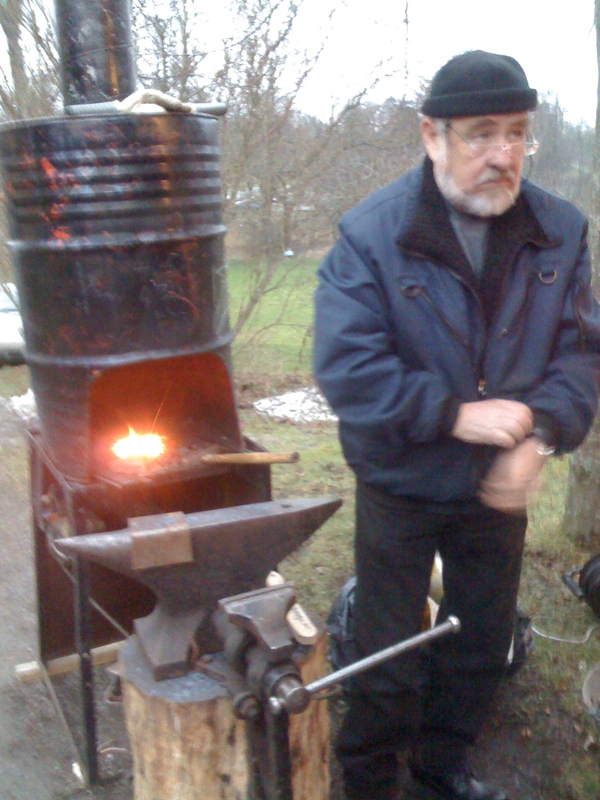 ), but after a while the wind picked up, and the cold started to get to us, so we went home for hot chocolate and “bullar” (raisin buns) by an open fire! 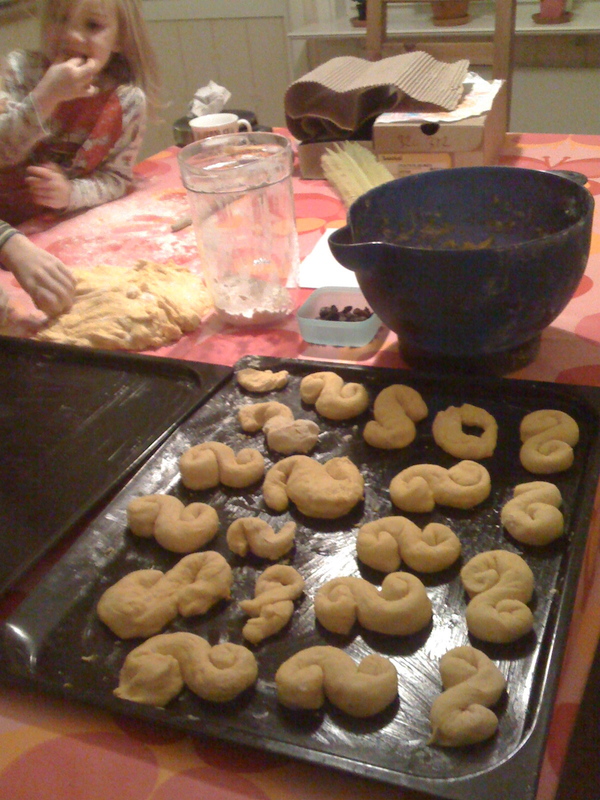 Then Richard did his baking stint with the kids and made the seasonal saffron bullar! 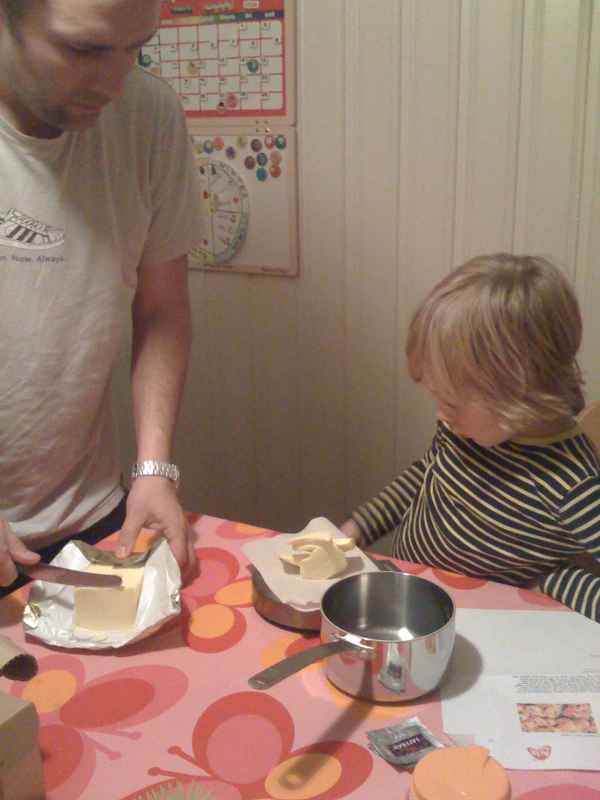 Leon measuring out ingredients using scales. 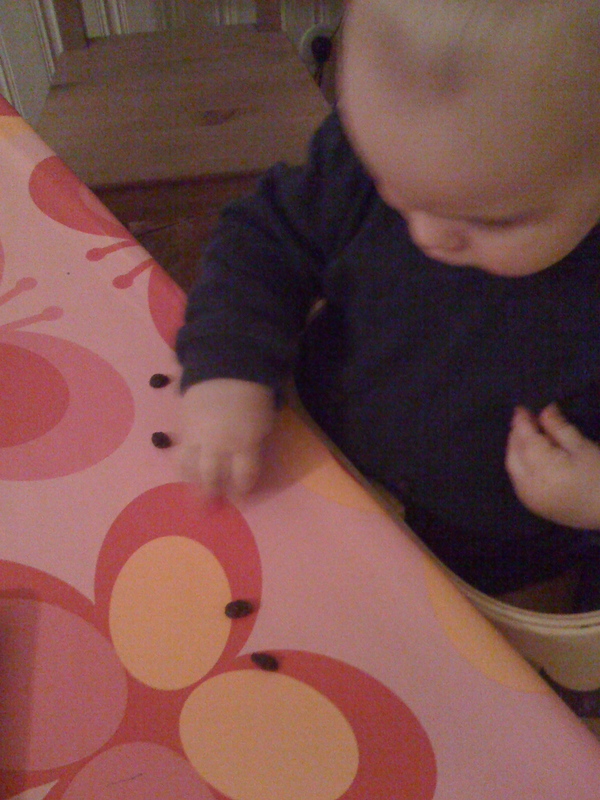 Alfie enjoys some raisins too! Woke up to a white blanket of snow over the garden (actually when woken at 5am saw nothing, but noticed this later at breakfast!!!). After a fantastic breakfast of pancakes, we went out in the snow! 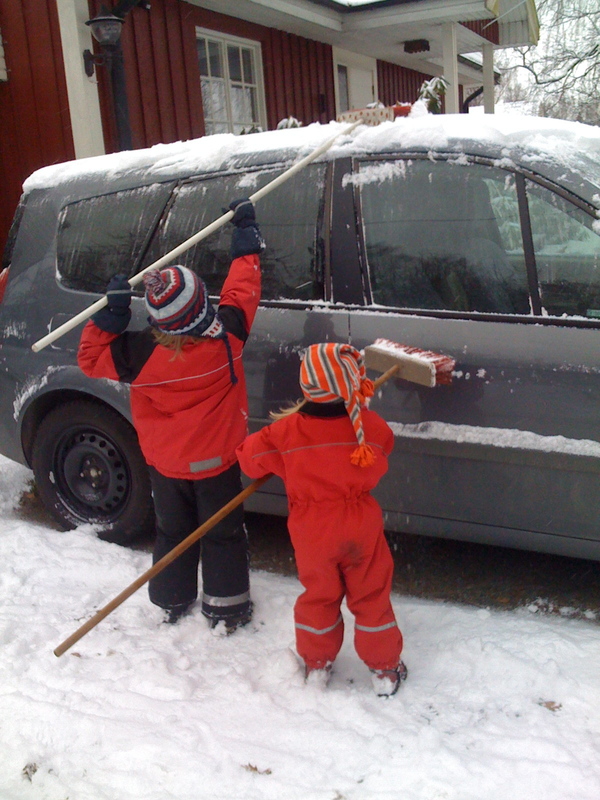 The kids attempted to brush the snow off the car.. 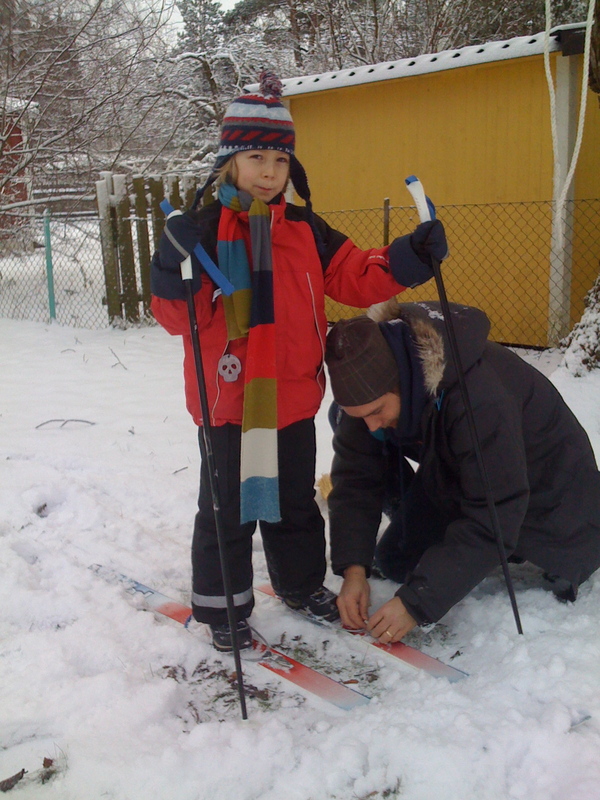 They tried out their skis…. The rest of the day was spent grocery shopping (and Leon and Maya choosing a present for Alfie’s birthday), and reading stories with Pappa (who arrived home last night). Lovely day with lovely family!!! That’s what I am. Totally sleep deprived. If it’s not Alfie, then it’s Maya or Leon who have been up coughing, having bad dreams, or just getting up too early. The mornings are now so dark, it’s totally black outside. Very hard to wake up. 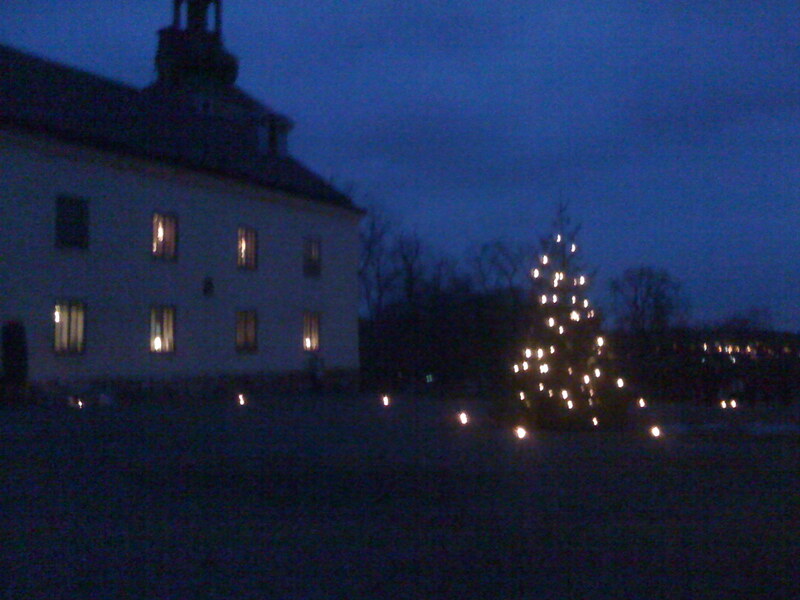 And the afternoons are getting darker more quickly – the sun is starting to go down around 3pm now. and the kids drew story maps of the story, while I read the book. 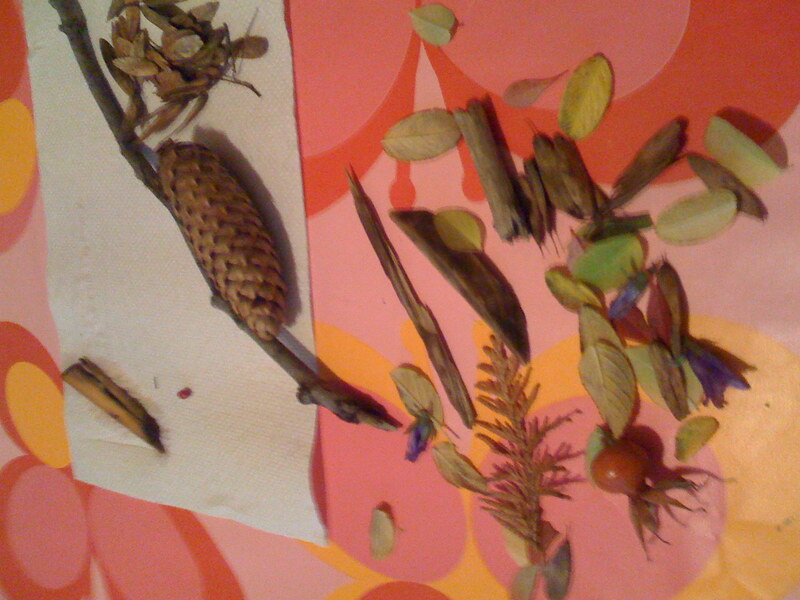 We talked about each object – the last summer flower, the dried up seeds and why the plant has “closed” itself, the rosehip and why we should not pick more than one, the beautiful shape of the fern leaf, etc, etc. We also saw a tree covered in reflectors – “why is the tree like that?” Leon asked, so we asked the lady of the house who just happened to come out – she told us that she never goes out with a reflector, but her husband says she must, so he had covered the tree to remind her she should always wear one! What a wonderful learning experience! Yesterday, Thursday, Farmor (grandma) came to stay. 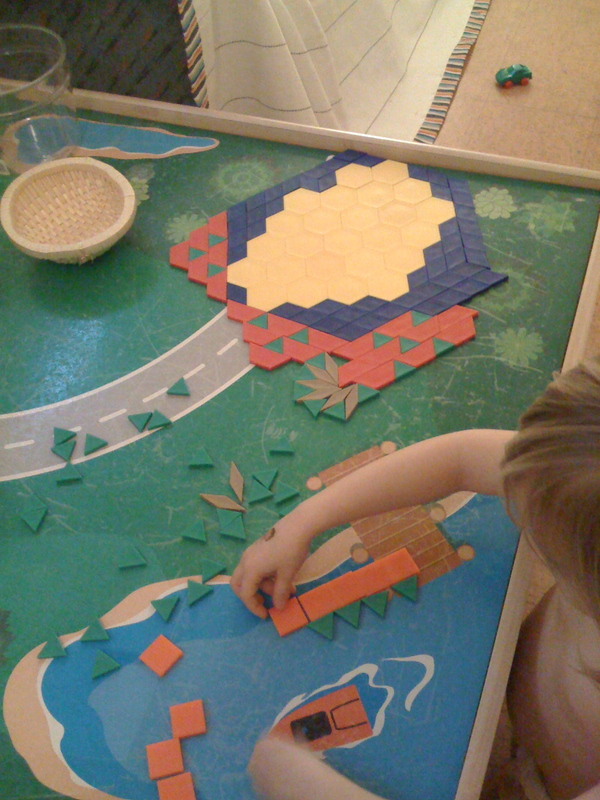 There was lots of play, reading, drawing, making, building done, and many many puzzles completed – and I’m sorry to say another film watched “Sleeping Beauty”. We went for a walk to buy some groceries, and the kids got an ice cream each (Thursday is our ice cream day!) despite it being minus degrees outside! 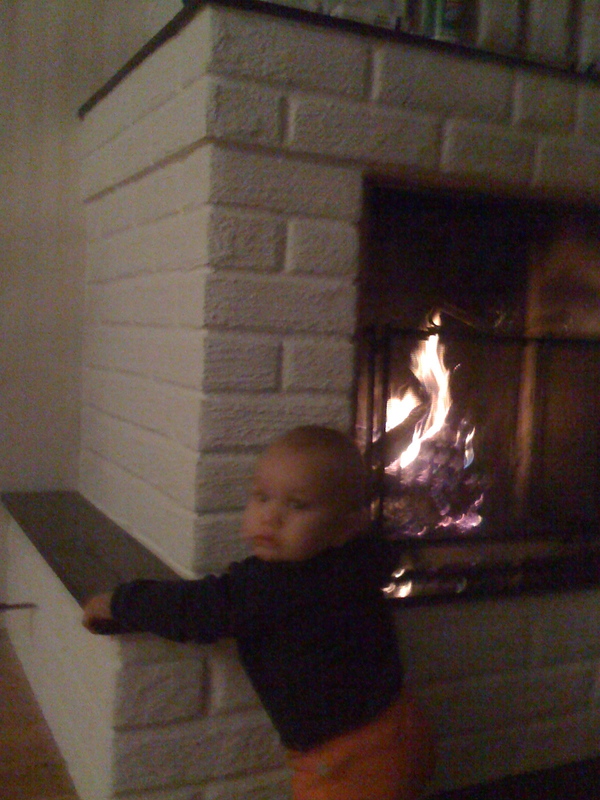 This morning Leon had Farmor all to himself, while I took Maya to gymnastics (which she loves! 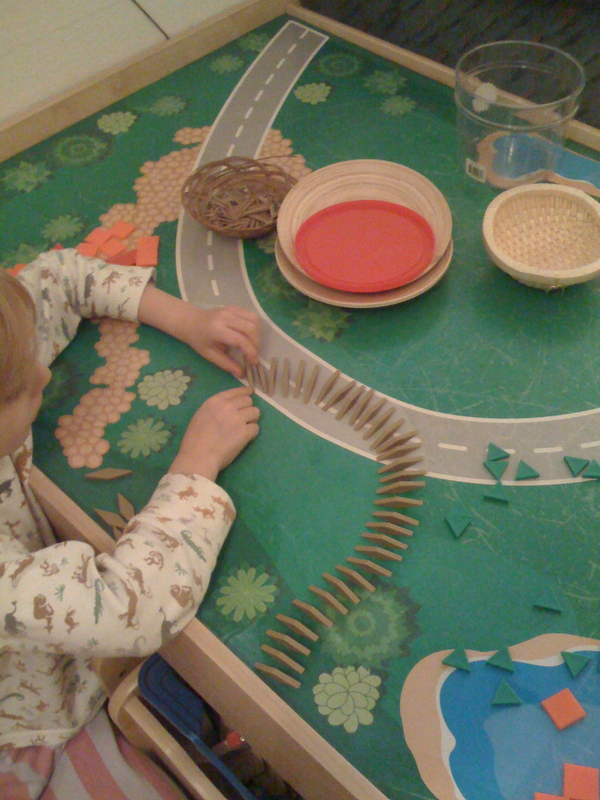 ), and this afternoon it was more play,reading, puzzles, baking and clay (Leon made a pot, Maya a hedgehog!) 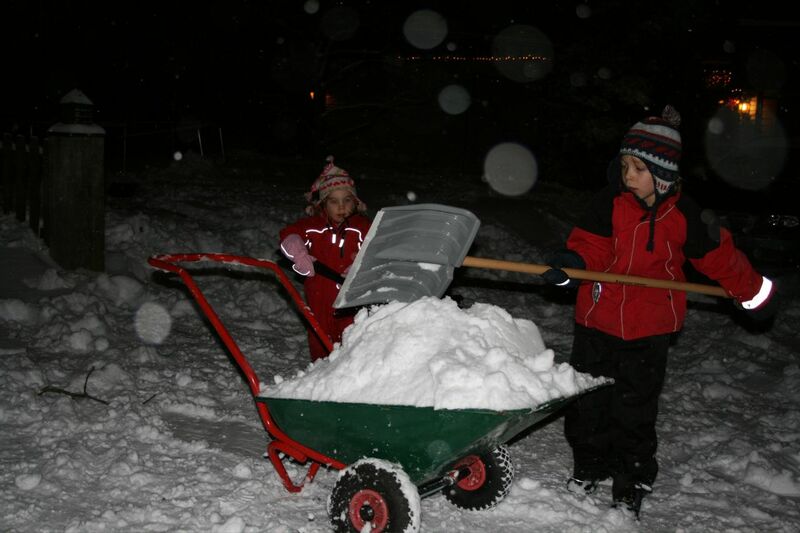 And now the kids are in bed, and Farmor has gone home. 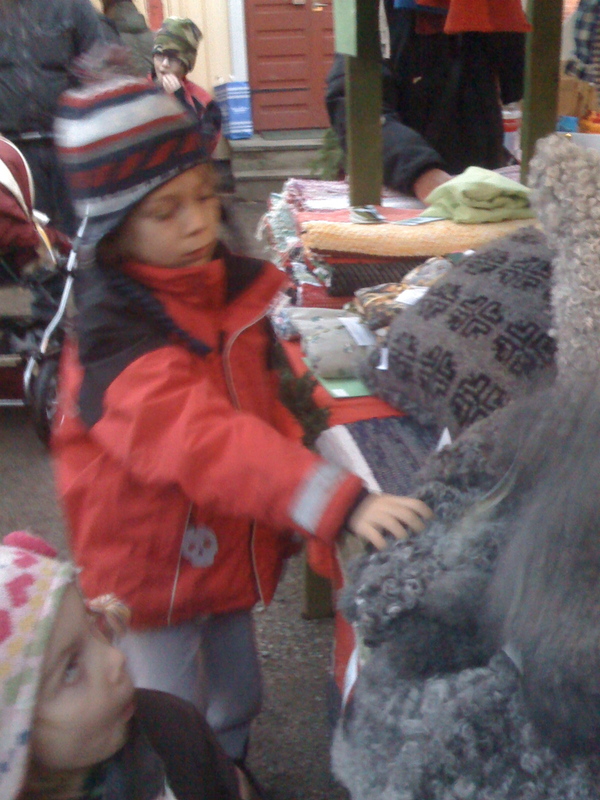 The kids love to see Farmor – she plays with them so well and often makes them laugh! I feel a little disappointed in myself that I have not planned any specific activities these last two days….but Richard has been away in Budapest, and Farmor was here, and I have been feeling so very very tired as Alfie is still waking a lot at night. But then I think, I’m not officially home educating, and I can actually relax. And that’s one good thing about school! Today it was grey, rainy and very very windy. I longed for California today. Leon seemed more unwell than yesterday, “I just wish I could go outside” he said sadly looking out the window… (though I think it’s more tiredness from being ill that made him so gloomy!!). Despite this, another great “homeschooling day”!!!! I decided to continue with the traditional fairy tales theme, with something a little more for Maya, a story she absolutely loves – “The Gingerbread Man”! 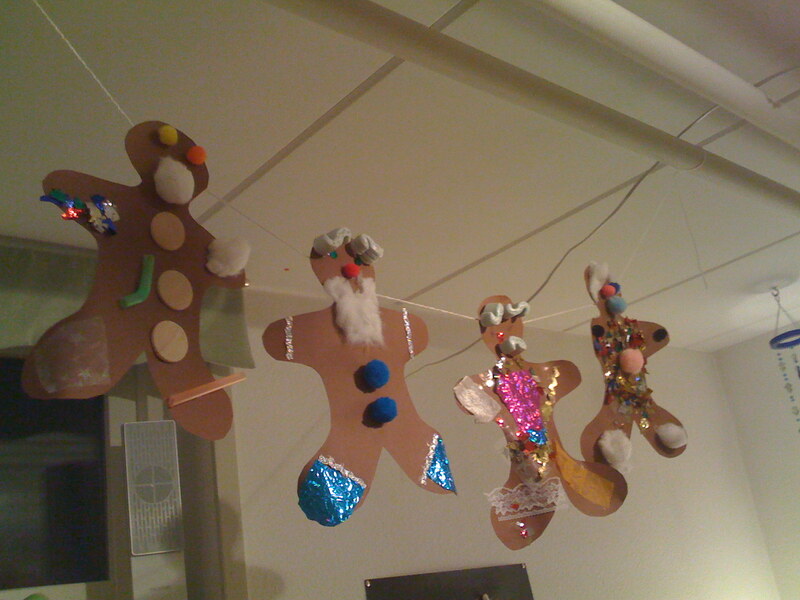 We read the story, and then made a line of decorated men – an easy craft, but fun, and (by swedish standards) Christmassy. Added to this the kids initiated much of their learning from resources I had set out, or from the workshop resources. experimenting with 2D shapes as dominoes. 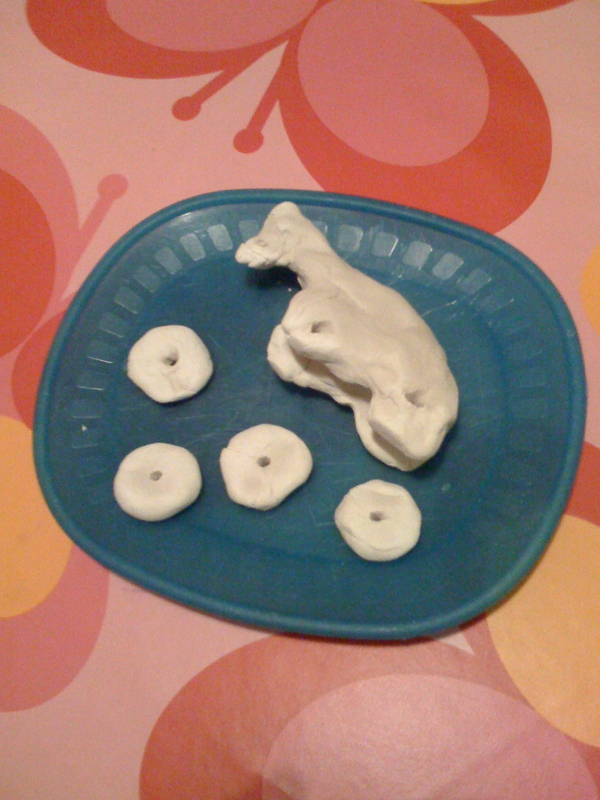 First steps of clay pull- toy horse..
and busily started to role play with the kitchen equipment set out for Alfie to play with..
…which I suspect came from the “Wall-E” film of which they watched half of today. I usually only allow them to watch one film during the week days, but I figured that we were all ill, it was crap weather, and yesterdays was my choice! 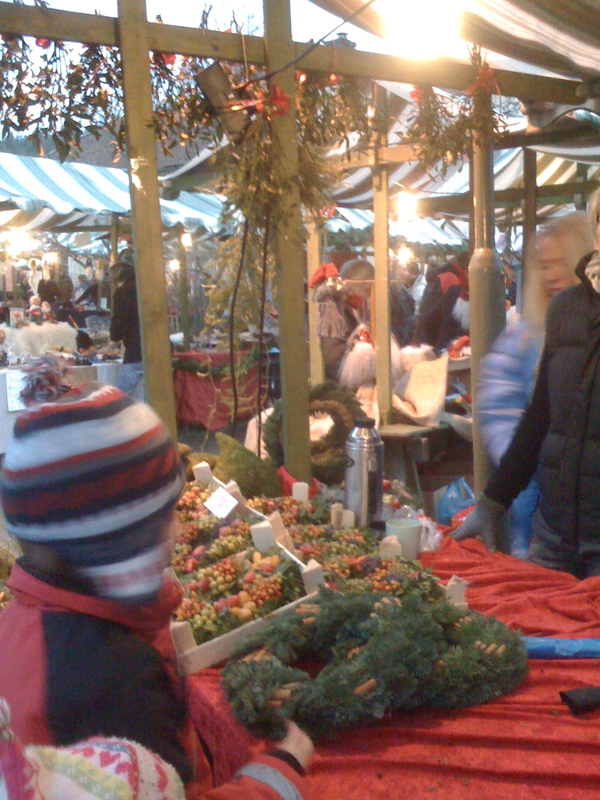 Though they’ll probably want to watch the other half tomorrow…!